I was very lucky to meet Tim Burton as well as Ken Ralston from Sony Imageworks, I've been working directly at the film set in Plymouth and later on at the set in LA, it's been a great time working for one of my favourite directors. Seeing Johnny Depp's performance was also mindblowing, he's amazingly talented. Below are some images that have just been released officialy. I will show you the huge pile of the other character designs I did after the film's release in 2010. Bin ein grosser Fan deiner Arbeit! Hi Michael. I enjoy your work in this movie but I'm here with a little question regarding your name spelling. I'm a Russian translator and need to know it in order to transliterate your name correctly. I suppose your second name should sound like a German word Kutsche (Kuche, if written using English transliteration). What about your first name, I'm not sure which way you prefer: either in German way (like Michael Schumacher) or in English way (like Michael Jackson). Would you be so kind to answer my question? Wow your art is so amazing! 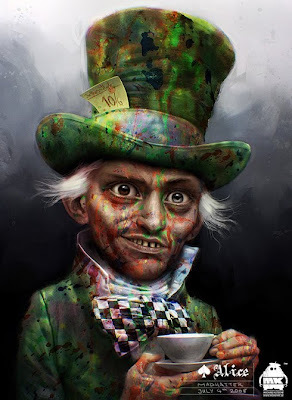 I love your Mad Hatter - he looks fantastic and just as i imagined him in my own twisted mind. Do you sell these in line art so others can colour etc? Great stuff man! I've been a long time follower of your work. Keep up the innovation! thanks for those kind words, really appreciated! My name is Kevin Eslinger and I have two galleries in Colorado. I was wondering if you would be interested in allowing me to resell some of your prints. I would also like to plan a time when we could do a group show if you are interested. Queríamos felicitarle por los excelentes trabajos realizados. Realmente la imaginación cambia este mundo. You're designs were all so stunning and, I have to say, I really do prefer your Hatter to the one on film. I just couldn't quite get into the Kabuki make-up. Congratulations on all the press, well deserved! You make an amazing work!! Incredible!! My dream is to be like you! 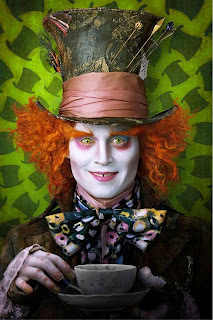 I have to say, I prefer your Mad Hatter (either one) to Depp, and that surprises me. But I love and am terrified by your March Hare. I am impressed your works! Liking the steam punk influence. 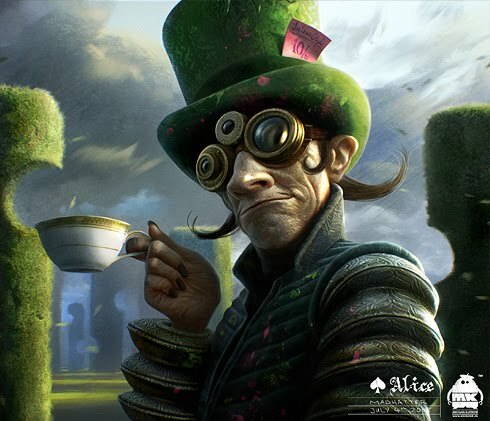 Love your "Alice" work.